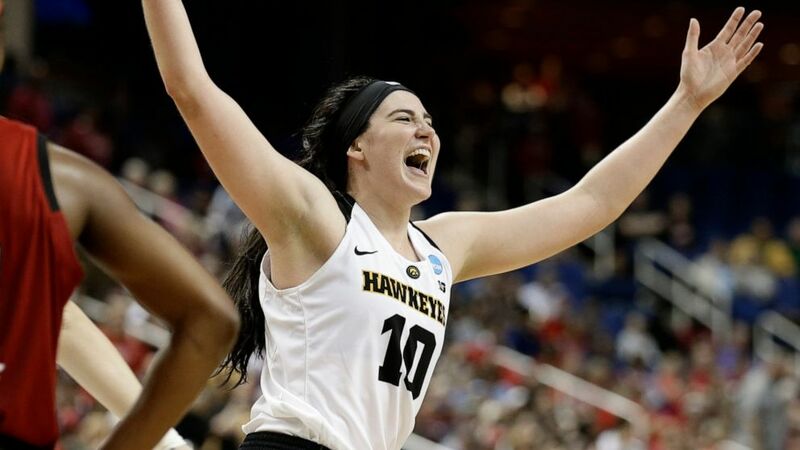 Picture this — a little girl growing up in a town with a population of 164 people shooting hoops at the town hall outdoor court has now arrived in New York for the 2019 WNBA draft. Who would have thought? I certainly didn’t. To say this past year has been extraordinarily special would be an understatement. Big Ten Tournament Champions, undefeated on our home court, first Elite Eight appearance since 1993, and a weekend in Tampa Bay that I won’t soon forget. Even though my team and I did not make it to the Final Four, I wouldn’t have written this past season any differently — I love my coaches and teammates so much, and I am so grateful that I got to wrap up my college career wearing an Iowa jersey in the way that I did. I flew into Tampa on Thursday, and was quickly whisked away for an ESPNW podcast at the arena. Shortly after, I went to the AP press conference with my family and coaches. I already knew that I won AP player of the Year about a week prior to this announcement, and as most of you know, I found out in the best way possible — by reading a surprise letter from my coaches ! After this, there were two more ceremonies back-to-back: the WBCA All-American team announcement and the Naismith Starting Five celebration. It was truly awesome to be in the same room with the other All-American stars that I had heard of throughout the season; quite honestly I was honored to even be in their presence! Next, enter Ann Meyers, Nancy Lieberman, Katrina McClain, Cheryl Miller, and Lisa Leslie. ARE YOU KIDDING ME? I was most certainly in basketball heaven, and I feel incredibly blessed and thankful that I received the Lisa Leslie Award for the best center in America. As much excitement as these ceremonies brought me, I think the best part of the day was when my family, coaches and I went to the Naismith award dinner that night. We were given a couple of hours just to talk with and get to know the inspiring person that is Lisa Leslie. I also got to meet her wonderful family, received some amazing advice about the next level for basketball, and I even showed her my double ball Mikan drill video – talk about a post player’s dream! The next day I was extremely honored to receive the USBWA Ann Meyers Drysdale Player of the Year Award, and I even ran into Maria Taylor and Rebecca Lobo in the arena as they arrived for the first Final Four game — I was completely starstruck! That night I went with my family and coaches to the games and went on court for the Naismith Starting Five presentation. It was a whirlwind weekend, and to be honest I am still overwhelmed. To top it all off, the Naismith Player and Coach of the Year award was announced while I was in the airport on my way back to Iowa; I am so happy for Coach Bluder for receiving this award, she earned this and then some! All in all, I am so thankful that I had a wonderful experience during my last season as a Hawkeye, and I am looking forward to what’s next for this small-town girl! And finally, to anyone who wants to dream big — keep dreaming, work as hard as you possibly can, love what you do, and most importantly, thank the people who will help you achieve success because you couldn’t have done it without them! Next up: The B1G Apple (see what I did there).